The thing that drove an increase in frequency and sophistication in inter-city travel was a need by more people to visit other cities for business...currently we have no such need for business travel into space (Earth orbit, Lunar surface, Mars...); but once that happens, then yes, there will be massive pressure for innovations in space-lift. Two ways that such a situation could happen is either we discover something extremely valuble off-world, or someone comes up with a new type of cheap space launch technology that others use to take their business into space. Either way, there does need to be a drastic change in the reason we go into space to change the WAY we go into space. Yeah, I imagine we'll get better launch vehicles after a few executives have to fly steerage to investigate their employer's newly purchased space assets. "Johnson, based on your advice we've decided to pursue the acquisition of Solar Array 237. We're going to send a team to look at the facilities." "Now, how many gees can you stand?" I'm not sure the development of stagecoaches (and later railroads) is really analogous to spaceflight. True, they have some common elements: they have both been pushed as a matter of national prestige (though spaceflight bears the bell away in this regard), and they both require a large amount of organization between multiple industries. But demand cannot really push development in spaceflight. We are at a point now where even if there was a much higher demand to get into space, we are limited to chemical rockets. And unless we have a technological breakthrough, we will continue to be limited to them. Granted, huge demand resulting in huge amounts of money for research may lead to a breakthrough being discovered sooner, but there is no guarantee of that. As I see it, the only real issue is getting to orbit. That is were the money is right now, since orbit can be used for many useful and profitable sorts of satellites. Deep space exploration, alas, doesn't have much in the way of an immediate return. Well, the analogy is more in the field of how we use tecnology. Stagecoaches after all weren´t a revolutionary new tecnology but instead a new, more efficient way of using it. There are potential improvements in chemfuel launch, from mass production to reusables, and more speculative alternatives from laser launch to elevators. But there's no real push for any of them, because the current and projected traffic does not justify the development cost. There is a sort of chicken and egg problem with expanding human presence in space. 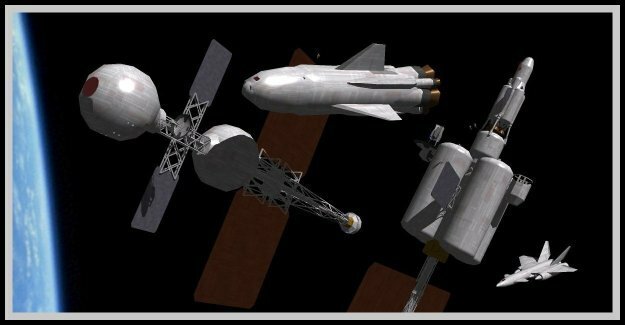 I have recently re read a presentation on the "Aquarius system", a pressure fed SSTO launcher loosely derived from the 1950 era "Hydra" sea launch program. The launcher delivers a one ton payload of fuel, consumables or duct tape at a very low cost per launch or per kilogram. The low cost is predicted on very relaxed standards (up to 33% loss rates are accepted) for bulk, low value cargo launches. The added value that I can see is each successful launch provides a lot of pre built volume for storage, living space or even refurbishment as parts of deep space vessels. With a diameter of 4 meters; LH2 tank length: 21 meters; LOX tank length: 8.4 meters; GH2 Pressurant tank length: 4 meters; total length: 43 meters, a lot of low cost "real estate" becomes available. This might be enough to spur a "land rush" to claim and utilize these vehicles in orbit (and there will be a lot, economic considerations suggest they have to be built and launched at a rate of 100/year for the company to be profitable). Even with the projected 33% loss rate, there are still over 60 available every year for re-purposing. The technology isn't new at all, just repackaged, and manned spacecraft to take advantage of these building blocks don't have to be more sophisticated than a Soyuz or LEM. A few high cost, high reliability launches for the manned spacecraft (perhaps in conjunction with crew changes on the ISS) to gather cargoes and round up spent Aquarius launchers should be enough to start. I do take the point about developing SSTOs and such, there is certainly room to improve, but I still think the only way we will have a 'gold rush' situation is when a new technology is developed that dramatically lowers launch cost. Still, the Aquarius system is definitely an interesting idea. Viz orbital real estate, I did always think that rather than letting the Mir burn up, of no use to anyone, they should have boosted it to a middle-high orbit where it would not be in danger of being damaged and just left it there in case anyone came up with a use for it. Even if it were just scavenging it for metal plating or whatever, it is still manufactured materials put up in space at enormous cost. Why not leave it there in the hope that it may be of use to someone again? The real leap, in many ways, may have been what was at best a relatively marginal technology and applying it to passenger service. The novelty fact certainly contributed to early growth. But, the railroads did have an advantage over space travel: there were already folks living at both ends of the line. From many of the previous discussions, it seems we all agree that the tech exists for (relatively) cheap space-flight - just not the will. In regards to that, I'd have to say that it's very telling that most sci-fi media with a convincing backstory (e.g. something that people accept as a sensible premise) usually involve an Earth Shattering Kaboom, or crippling over-population, or some other major calamity that makes getting off of Earth very attractive. Pretty much, there has to be a very convincing answer for "Why would we want to leave Earth?" for us to even contemplate putting the infrastructure in place to do so. Doesn't seem like we'll find an adequate answer anytime soon (although who knows? SCIENCE! might have something up its sleeve) and for that matter, by the time we do find one (e.g. something pushes Mars into intercept course with Earth) it'll probably be too late to pull a Firefly and leave "Earth-That-Was" in droves. I (hazily) recall reading that re-using structures - especially fuel tanks - is problematic. Perhaps even in hard vacuum trace amounts of the stuff hangs around, so you can't really safe the tankage for human use. But the underlying challenge is that only space geeks like us worry about launch capacity as such. In the real world they're just concerned to launch particular payloads. I'm not sure that it is a question of not having the will. We are doing quite a lot in space, including deep space - there are probably a dozen or so interplanetary missions en route, that we mostly forget about until they reach their destinations. It's just that human spaceflight has turned out to be a modest part of the whole picture, instead of the entire picture, as was assumed in the pre-automation 50s. On the one hand I'll grant there does not seem to be a lot of incentive to develop new or revolutionary space technologies because there is no economical incentive to do it. However spaceflight is a brand new endeavor. I've made the point before that between the Columbus expedition of 1492 and the building of a true self-sustaining permanent colony on Plymouth Rock, a few centuries rather than a few decades had elapsed. We have been caught kind of off-guard by the as yet unseen rapidity of technological evolution. It made us want everything, and made us want it now. I believe Apollo was a mistake. It was too early. It promised us the Moon, but in a way it was less even than the first Columbus expedition. The expectations it set up, however, were unrealistic. It was a showstopper, and an impossible act to follow. The Space Shuttle was an attempt, and in some ways it was successful at furthering the dream, but in the end it was also a failure because Apollo was such an impossible act to follow. The problem with this is that our expectations were thrown too high, and when reality came back to cash in its chips the "down" was, as far as the general public was concerned, disillusionment. But this backlash is actually as disproportionate as the expectations born from Apollo. Slow and Steady has been the post-cold-war way, and it has worked wonderfully. Orbital space is full of satellites that coordinate our daily lives, from weather forecasts to telecommunications to precision navigation. We have observatories and telescopes making new discoveries about the fundamental structure of the Universe, there are dozens of deep space probes on location or on the way, and there are rovers on Mars! How can we even say "there is nothing in space" for us. Truth is, we are impatient. We want it all now, colonies on the Moon and bases on Mars and spaceships on the way to Jupiter. Sadly neither of these are likely in our lifetimes. But what are our lives compared to the thrust of civilization? Who are we to say today there is no need for new launchers and heavy space traffic? Space isn't going away, it'll wait for us. Just because we can't envision right now the kind of traffic that requires a space elevator and cities on the Moon and colony ships on the way to Mars doesn't mean they'll never happen. We might not even need an Earth-shattering kaboom to do it, just a shift in our needs and desires, and those are a dime a dozen if history is anything to go by. Take away Apollo and the space age looks much more like a steady progression, from orbital test flights and experimental probes to a standing orbital presence and numerous deep space missions. I think Apollo was one bridge too far. Sadly it discolored our view of what the space program should look like by seeming to succeed and making subsequent efforts look like failures. In the end I think it did far more harm than good to the space program. I'm not sure about the inadmissibility of used fuel tanks as real estate. I have read of proposed "wet launch" systems where the space station module doubles as a fuel tank during launch, and there were endless proposals to repurpose Space Shuttle external tanks (extra delta V was required to ensure they did not make it into orbit). Hardware might have other uses besides living space, and we might not even realize what the most profitable use is at first. Maybe the killer app is a wreaking yard that disassembles hardware for reuse, or surface area for solar cells. The Apollo project did give us a very distorted view of what the space program "should" look like, but there were a lot of well thought out plans derived from the Apollo program to go to Mars and beyond; "2001 a Space Odyssey" was a pretty straight forward extrapolation of technology and goals as understood in the mid 1960's (only the HAL 9000 AI was and is beyond our capabilities). For now the Apollo program should be compared to the Vikings getting a toehold in Labrador ("Vineland") rather than Columbus sailing to the Caribbean. I actually recognize the stagecoach sign: It's over in Old Sacramento, just twenty minutes from my front door. This does bring one thought to mind: Sacramento is one end of the Pony Express. How would that play out in a SF setting? Like the stagecoach, but applied to an even faster, leaner concept. Pure speed. Small cargoes, sent out with the maximum priority imaginable. Medicines, data chips, perhaps even fusion plant engineers. Welcome to the comment boards! 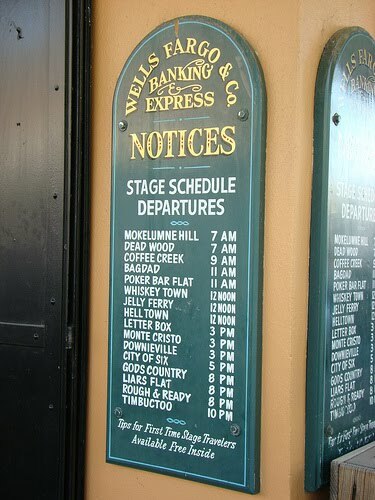 Yes, the sign is in Old Sacramento, though I merely swiped it off the Internet. What you are describing is much like what I call courier ships, intended to carry a small payload at the highest practical speed. This probably works best in an FTL setting where there are no FTL comms, so that mail as well as express parcels must be physically transported. In an in-system setting, or with FTL comms, express material probably just goes on fast liner types, because there's not the message traffic. "This probably works best in an FTL setting where there are no FTL comms, so that mail as well as express parcels must be physically transported." I actually work on a universe where FTL comm exists, but at extremely low bandwidth and huge costs. It is exclusively reserved to coordinate wormhole gates (to avoid silly things like causality breakdowns that would destroy the network) and absolutely time-critical military communication. By low bandwidth I mean text-only, and every bit takes a second and costs millions. Everything else has to be carried physically. Interstellar trade is focused almost exclusively on data. You CAN have your cake and eat it, too. Just bake two.